Inside look at a room in the building. The building is a converted convent. 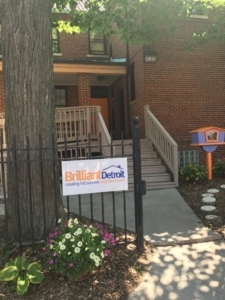 When it came time to choose a project partner I remember conversations I had with Danielle and Medvis about this amazing non-profit called Brilliant Detroit. They focus on creating kid success neighborhoods. They offer programs for children 0-8 years and their parents and families. I was immediately interested and Medvis connected me to their CEO Cindy Eggleton. Cindy was pure joy from the moment we met. 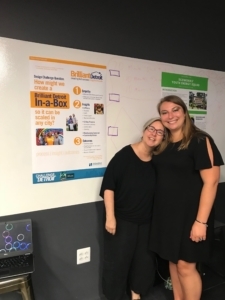 She filled me in on the current state of the non-profit and explained to me that they were growing rapidly this year going from 4 open houses to 8 houses by December 2018. Everyone is falling in love with the work they are doing and they need to expand strategically. The task that she asked me to work on is “Brilliant Detroit in a Box”. How to take the magic that is happening here in Detroit and replicate and implement it successfully in other cities around the country. I hit the ground running the first Friday in June at the Brilliant Detroit headquarter location in Southwest Detroit. I set up interviews and took in all of the activities that were happening around me. After 16 interviews from the housekeepers to the founders and everyone in between, I identified the necessary processes that need to happen in order to successfully open up a Brilliant Detroit location in a new city and neighborhood. Cindy Eggleton and Rachel Pawluszka at final poster presentation. time to present my findings to the Challenge Detroit community. I created a poster along with my cohort that explained my process and the deliverables over a gallery style lunch event. It was great to get feedback from my work and witness everything that the cohort has accomplished not just over the past six weeks but the past 11 months. I am truly grateful for the opportunity to work with Brilliant Detroit. They have opened my eyes to the fact that it is and will always be about kid success because they are the future of this city.